Welcome back to our series on Education Innovation Fund projects. This week we’re hearing from Chemistry Lecturer James Redman and student Christopher Elgar who have used their seedcorn funding to evaluate electronic lab notebooks to replace paper-based lab reports. Practical work forms a component of most taught programmes in the physical and life sciences. As well as reinforcing theory, practical work aims to give students experience in laboratory techniques, record keeping, analysing data, planning experiments, team work and reporting to professional standards. Students would typically take notes during a laboratory session itself, which would then be followed up by a full report that ranges in format from a series of questions in a pro-forma to a journal-style article. Electronic notebooks have been widely adopted in industry and we therefore wanted to examine whether the systems currently available could be applied in the context of taught degree programmes. Considerations were (i) ease of marking and giving feedback; (ii) flexibility to adapt to different disciplines and styles of report; (iii) opportunities for group working; (iv) costs. Over the summer we trialled seven lab notebook and portfolio systems by entering typical lab reports containing text, images and diagrams of chemical structures. Chris tried to share his documents with me and I added feedback. These systems were compared with what we already have available in Blackboard and we were able to draw a number of conclusions about what would work most effectively for us. There are a number of commercial e-notebook systems available and we selected two cloud systems that have been marketed at academia. A short term subscription was purchased for Perkin Elmer Elements (https://elements.perkinelmer.com/) and a free trial obtained for LabArchives (http://www.labarchives.com/). It quickly became apparent that IndigoELN, an open source offering, is very specialised for medicinal chemistry and was designed for capturing synthetic chemistry protocols and structures of organic compounds. Although it is used by Pfizer and hence is highly authentic, the lack of flexibility and difficulty adding feedback meant that we felt it was not well suited to the majority of undergraduate level practical work. SciNote is structured around projects, workflows and protocols. It might be a good fit for some research labs or routine work, but did not seem to lend itself to undergraduate work where most of the experiments are one-offs for the student. eLabFTW offered an authentic e-notebook experience with the ability to create formatted text reports of experiments through a browser interface. Sharing of documents is possible although the ability to add feedback seemed more limited. It might be suitable for reports from smaller classes on advanced practicals. LabTrove reports adopt a simple blog format where comments can be posted at the end. 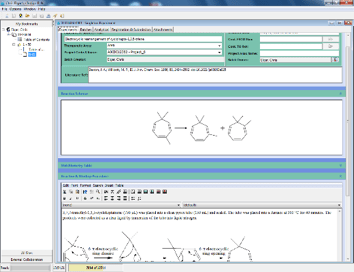 There is some integration with the Royal Society of Chemistry’s database, ChemSpider, that allows chemical structures to be inserted. Developed at the University of Southampton, LabTrove is currently used for one of their chemistry practicals. However it does not appear to be under active development, although a successor, known as “labdog” is on the way. This will combine the job of a lab manual, providing instruction, with questions that prompt reflection and submission of photos as evidence of completion of steps. Both of the commercial offerings, Elements and LabArchives, were fairly straightforward to get to grips with. As the name suggests, in Elements the notebook documents are composed from a selection of “elements” such as abstracts, protocols, images and chemical structures. There were some useful chemistry features such as built-in structure drawing, but we felt this was by no means a chemistry-specific product. The LabArchives platform offered similar features, but we felt it was more flexible and also well suited to research labs. An edition with classroom features aimed at facilitating staff-student interactions is also available. Being commercial products, these systems are licensed per user. Mahara seemed like an excellent tool for constructing a portfolio of lab experiments that could include a report and reflective commentary. Although it is not a suitable tool for processing experimental data, managing lab workflow, chemical structure searching etc., these are not major concerns for the majority of undergraduate work. We found it easy to use and the features for adding feedback were great. It is well established and there seems to be an active community of users. Downsides are that it does not integrate with Blackboard, and is not an authentic e-notebook. By comparison, the mark-up language of MediaWiki had a much tougher learning curve which we thought some students and staff would find off-putting. The wiki tool in Blackboard was more straightforward for a novice. The wikis also lack the structure that is supplied by a dedicated e-portfolio system like Mahara. We felt that although the wikis would work well for sharing lab protocols, the e-portfolio would be a better choice for recording and reflecting upon a programme of lab activities. Taking things forward, our next steps will be to run a trial with a small group of students on a real practical module. We see potential for Mahara as this is now available centrally and we envisage it being of use in other parts of our degree programmes such as placements in industry and overseas. An open source notebook such as eLabFTW could also be a valuable experience for students taking year 3 or MSc level practical classes.